The four sets of option boxes inside the Color Picker dialog box represent color models — or, if you prefer, color modes (one less letter, no less meaning, perfect for you folks who are trying to cut down in life). Color models are different ways to define colors both on screen and on the printed page. Outside the Color Picker dialog box, you can work inside any one of these color models by choosing a command from the Image ^ Mode submenu. In doing so, you generally change the colors in your image by dumping a few hundred, or even thousand, colors with no equivalents in the new color model. The only exception is Lab, which in theory encompasses every unique color your eyes can detect. Rather than discuss the color models in the order in which they occur in the Mode submenu, I cover them in logical order, starting with the most common and widely accepted color model, RGB. Also, note that I don't discuss the duotone or multichannel modes now. 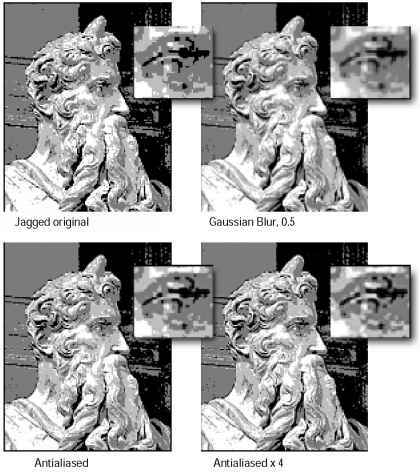 Image ^ Mode ^ Duotone represents an alternative method for printing grayscale images, so it is discussed in Chapter 18. The multichannel mode, meanwhile, is not even a color model. Rather, Image ^ Mode ^ Multichannel enables you to separate an image into independent channels, which you then can swap around and splice back together to create special effects. For more information, see the "Using multichannel techniques" section later in this chapter. RGB is the color model of light. RGB comprises three primary colors — red, green, and blue — each of which can vary between 256 levels of intensity (called brightness values, as discussed in previous chapters). The RGB model is also called the additive primary model, because a color becomes lighter as you add higher levels of red, green, and blue light. All monitors, projection devices, and other items that transmit or filter light — including televisions, movie projectors, colored stage lights, and even stained glass — rely on the additive primary model. ♦ Red and green: Full-intensity red and green mix to form yellow. Subtract some red to make chartreuse; subtract some green to make orange. All these colors assume a complete lack of blue. ♦ Green and blue: Full-intensity green and blue with no red mix to form cyan. If you try hard enough, you can come up with 65,000 colors in the turquoise/ jade/sky blue/sea green range. ♦ Blue and red: Full-intensity blue and red mix to form magenta. Subtract some blue to make rose; subtract some red to make purple. All these colors assume a complete lack of green. ♦ Red, green, and blue: Full-intensity red, green, and blue mix to form white, the absolute brightest color in the visible spectrum. ♦ No light: Low intensities of red, green, and blue plunge a color into blackness. As far as image editing is concerned, the RGB color model is ideal for editing images on screen because it provides access to the entire range of 24-bit screen colors. Furthermore, you can save an RGB image in every file format supported by Photoshop except GIF and the two DCS formats. As shown in Table 4-1, grayscale is the only other color mode compatible with a wider range of file formats. Table 4-1 lists color models in the order they appear in the Image ^ Mode submenu. Again, I left out the multichannel mode because it is not a true color model. The one exception is with duotones. Notice how I've included an asterisk (*) to DCS 2.0 support for duotones. This is because you can save a duotone in DCS 2.0 only after first converting the image to the multichannel mode. For more information, consult Chapter 18. As for the double asterisk with PNG in the Bitmap column: PNG supports Bitmap mode only on the Mac OS. On the negative side, the RGB color model provides access to a wider range of colors than you can print. If you are designing an image for full-color printing, therefore, you can expect to lose many of the brightest and most vivid colors in your image. The only way to avoid any color loss whatsoever is to have a professional scan your image to CMYK and then edit it in the CMYK mode, but then you're working inside a limited color range. Colors can get clipped when you apply special effects, and the editing process can be exceptionally slow. The better solution is to scan your images to RGB and edit them in the Lab mode, as explained in the upcoming "CIE's Lab" section. Back in Photoshop 2, the Modes menu provided access to the HSB — hue, saturation, brightness — color model, now relegated to the Color Picker dialog box and the Color palette (discussed later in this chapter). Hue is pure color, the stuff rainbows are made of, measured on a 360-degree circle. Red is located at 0 degrees, yellow at 60 degrees, green at 120 degrees, cyan at 180 degrees (midway around the circle), blue at 240 degrees, and magenta at 300 degrees. This is basically a pie-shaped version of the RGB model at full intensity. Saturation represents the purity of the color. A zero saturation value equals gray. White, black, and any other colors you can express in a grayscale image have no saturation. Full saturation produces the purest version of a hue. Brightness is the lightness or darkness of a color. A zero brightness value equals black. Full brightness combined with full saturation results in the most vivid version of any hue. In nature, our eyes perceive pigments according to the subtractive color model. Sunlight contains every visible color found on Earth. When sunlight is projected on an object, the object absorbs (subtracts) some of the light and reflects the rest. The reflected light is the color you see. For example, a fire engine is bright red because it absorbs all non-red — meaning all blue and green — from the white-light spectrum. Pigments on a sheet of paper work the same way. You can even mix pigments to create other colors. Suppose you paint a red brush stroke, which absorbs green and blue light, over a blue brush stroke, which absorbs green and red light. You get a blackish mess with only a modicum of blue and red light left, along with a smidgen of green because the colors weren't absolutely pure. But wait — every child knows red and blue mix to form purple. So what gives? What gives is that what you learned in elementary school is only a rude approximation of the truth. Did you ever try mixing a vivid red with a canary yellow only to produce an ugly orange-brown glop? The reason you didn't achieve the bright orange you wanted is because red starts out darker than bright orange, which means you must add a great deal of yellow before you arrive at orange. And even then, the yellow had better be an incredibly bright lemon yellow, not some deep canary yellow with a lot of red in it.